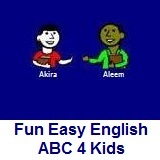 ﻿ Fun Easy English - new writing english alphabet for kids letter a. Hey kids, try writing the letter A.
I flew in an airplane when I was only 8 years old. I like to eat an apple at school. There are 3 ants eating my apple. An anteater is an interesting animal. There are many animals at the zoo. America is a very nice place. Abraham Lincoln was the 16th president of the United States of America.